How beginners can build a massive back with great back workouts - Read on here for five of my favorite back workout programs to help turn your tiny back into massive slabs of back muscles. In my 45-minute work out series, this week I am sharing with you a 45-minute back workout program. To get the best 45-minute workout possible, you will need to focus on the lateral pulling and vertical movements. I have seen the folks working out in gym for two hours, doing endless sets and reps of pull-ups and rows for getting a killer physique and a robust, ripped back. They work out so hard until they can’t move. To me that doesn’t make any sense. We have a better solution to workout for back. There’s no reason why can’t we do a good back workout in 45 minutes. In this 45 minutes back training program, we will focus on recruiting two “parts” of the back, along with two “types” of lift, to engage all the important back muscles. Why Lateral Pulling Movements? : Although, your back is a broad slab of muscle but it comprises of many sub-groups that, when developed, provide it a tapered V look into your waist and add some thickness to the upper torso. The major upper back muscles — the trapezius, the rhomboids and the teres minor and major — can be worked with lateral pulling movements, as well as some vertical ones. Why Vertical Movements? : Wrapping almost entirely around your ribcage in the back and along the sides is the latissimus dorsi (the lats). This is a GIANT muscle group and the one most responsible for the flare, taper and width we crave in a big back. Vertical movements will hit this most effectively. One thing that you need to understand is that no workout routine will help build muscle for you. Muscle building happens when the diet is correct. If the nutrition is inadequate, your muscle will not gain much. Thus, make sure that you include in your diet enough nutrition for gaining muscle. Now, to stimulate some great growth in your back muscles – this 45-minute back workout routine is guaranteed to add inches of width to your back as well as thickness! Wide-Grip Pull-Ups: The wide grip pull up is the king of all back building exercises, and all your need is a pull up bar! (i) Take a wider than shoulder-width overhand grip on a pull-up bar, hanging freely with your arms extended. This will be your starting position. Tip: Generally speaking the wider you go, the wider you’ll get. (ii) Look up towards the bar, and slowly pull yourself up. Do not swing or use momentum to complete the movement. Attempt to get your chin above your hands or over the bar. (iii) Pause at the top of the motion before slowly lowering yourself to the starting position. (iv) Repeat for recommended number of reps.
Set: 3; Reps: To failure. Take no longer than 60 seconds to rest between sets. 2. 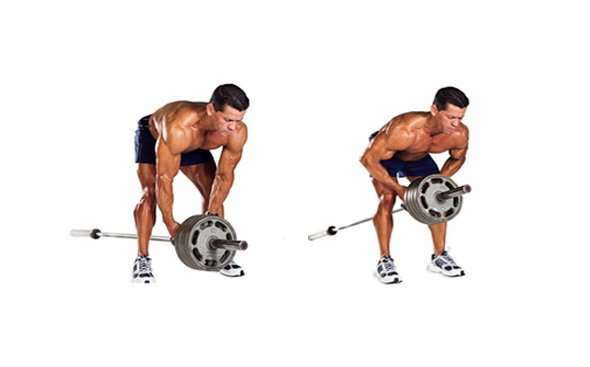 Bent-Over Row: The bent-over row is a compound exercise that works many muscle groups. The main muscle group targeted is your back, the latissimus dorsi and rhomboids. (i) Grab a barbell, load desired weight on it and set it down in front of you. (ii) Stand with your feet at around shoulder width. While bending your knees, squat down and grip the bar using overhand grip (thumbs at the bottom) with your hands slightly wider than shoulder width. Make sure that your head is up; back is straight and almost parallel to the floor. The more upright you are, the more it targets your shoulders and not your back. The barbell should hang directly in front of you as your arms hang perpendicular to the floor and your torso. This is your starting position. (iii) Now, while keeping the torso stationary, breathe out and pull the bar up to just below your chest and not up into your chest. Keep the elbows close to the body and only use the forearms to hold the weight. Squeeze your shoulder blades together at the top of the movement and hold for a brief pause. 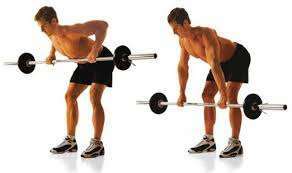 (iv) Then inhale and slowly lower the barbell back to the starting position. (v) Repeat for recommended number of repetitions. (i) Make sure you pull the bar up to the correct position. Do not lift it up too high (to your chest) or too low (to your stomach). (ii) Keep your back straight! If you bend at the back, you’re using too much weight. Keep your head up, and eyes looking forward throughout the exercise. (iii) People with back problems should not do this exercise. Instead they can do a low pulley row. (iv) Progressively increase the weight with each set, and again, rest no more than a minute. Variation: You can perform this exercise using a supinated (palms facing you) grip. 3. Reverse-Grip Lat Pulldowns: The reverse grip pulldown exercise targets the back muscles, which include the latissimus dorsi (broadest muscle of the back) or more commonly known as the “lats”. Also called as the underhand grip pull-down, this back exercise better stimulates the lower-lat muscle fibers, giving the appearance of thick, full lats all the way down to the waist. (i) Sit down on a pull-down machine with a wide bar attached to the top pulley. Select the weight you want to use and adjust the thigh (knee) pads according to your height. These pads will prevent your body from being raised by the resistance attached to the bar. (ii) While standing, grasp the pull-down bar with an underhand grip (the palms facing your torso – a supinated grip). Make sure that the hands are placed closer than the shoulder width. Holding the bar, sit down on the machine. This should take the weight off the stack. (iii) As you have both arms extended in front of you holding the bar at the chosen grip width, bring your torso back around 30 degrees or so while creating a curvature on your lower back and sticking your chest out. This is your starting position. (iv) As you breathe out, slowly pull the bar down until it touches your upper chest by drawing the shoulders and the upper arms down and back. Useful Tip: Focus on squeezing the back muscles once you reach the fully contracted position and keep the elbows close to your body. The upper torso should remain stationary as your bring the bar to you and only the arms should move. The forearms should do no other work other than holding the bar. (v) Pause for a second on the contracted position, then while breathing in, slowly bring the bar back to the starting position when your arms are fully extended and the lats are fully stretched. Do not let the weight touch the stack. (vi) Repeat this motion for the recommended number of repetitions. (i) Concentrate on using your lats to move the weight rather than your biceps. Your forearms should only serve to hold the weight, not move the weight. (ii) Squeeze your lats in at the bottom of the exercise and pause for a count of 1-2 to get the most out of this exercise. 4. T-Bar Rows: The T-bar row is a multi-joint exercise that increases strength throughout the upper body with an emphasis on the back and shoulders. The T-bar targets the middle of the back by positioning the resistance through the center of the body. (i) Position the end of an empty barbell into a landmine or in a corner of a room to keep it from moving. Load an appropriate weight onto your end. (ii) Load the opposite end of the bar with plates and straddle it. (iii) Stand over the bar, and hook a V-grip handle around the bar next to the collar and hold with both hands. You can hold the bar next to the collar with your both hands without using V-grip handle. (iv) Bend over at the hips until your torso is about a 45-degree angle to the floor with arms extended. This will be your starting position. (v) Keeping your lower back in its natural arch, squeeze your shoulder blades together and pull the bar until the plates touch your chest. Do not jerk the weight or cheat during the movement. (vi) After a brief pause, return to the starting position. (vii) Repeat the movement for recommended number of repetitions. 5. Wide-Grip Seated Cable Rows:The wide-grip seated cable row strengthens the back and shoulders. This exercise improves core stability and spinal alignment. The wide grip places increased resistance on the upper back and rear shoulder. (i) Sit slightly forward at a low pulley cable station in order to grasp cable attachment. Hold the straight-bar attachment with your hands slightly wider than shoulder-width apart. (ii) Using your legs, push your torso back positioning knees with slight bend and your arms fully extended. (iii) Keeping your chest forward, shoulders down, and back arched, pull the cable attachment toward your waist while pulling torso upright. Make sure to pull shoulders back and push chest forward while arching back. (iv) Return the weight to the starting position that is until arms are extended, shoulders are stretched forward, and lower back is flexed forward. (v) Repeat the movement for recommended number of repetitions. It’s recommended not to include all of these exercises in each and every workout you do for back muscle development, but by interchanging them from training to training with some of other best back muscles building exercises from here, you can maintain the stimulus high and also not allow your muscles to get adapted. Such constant change in your back workout plan is what needed to avert a plateau and helps push your strength levels to new extremes, so do make sure you are making use of a good variety.